Both Rhee and Kim wanted to reunify Korea by force and believed that the other side would fall easily, but their respective backers had different approaches. Aware that Rhee would provoke a war if permitted, the United States had refused to provide the ROK army with planes, tanks and artillery. However, Stalin approved Kim’s invasion plan, supplying the North Koreans with generous quantities of planes, tanks and artillery. When the North Korean People’s Army (NKPA) crossed the border on June 25, 1950, its large, well-trained army steamrolled through the unprepared ROK forces, starting the Korean War. Believing that remaining neutral would be interpreted as weakness by the Soviets, President Harry Truman won the support of the United Nations for the defense of South Korea, assigning the military response to General Douglas MacArthur, commander of the American occupation forces in Japan. Nearly bankrupted by the massive expense of WWII, the American army had been allowed to decline, while reinforcements were sent piecemeal, so the NKPA had gained control of all of Korea by August except for a small perimeter around the port of Pusan. The NKPA had already burned itself out with repeated frontal attacks when an amphibious landing at Inchon caught the North Koreans completely by surprise. Seoul was recaptured on September 25, and the NKPA began to disintegrate. Deciding to reunify Korea by force, an overconfident MacArthur dismissed China’s warning that it would not permit American troops near the Yalu River, the border between China and North Korea. The entry of hundreds of thousands of Chinese ‘volunteers’ into Korea in late November transformed the war. MacArthur rashly continued with the offensive despite the changed situation, and the unprepared UN forces were overwhelmed. Although a Marine division fought its way out of the Chosin Reservoir in early December, most of the UN forces were caught exposed, and were forced into a panicked retreat. As the UN forces are pushed southwards by the Chinese volunteers, an American division is ordered to retreat in preparation for a counterattack. Since the division will be vulnerable as it crosses a bridge, a platoon of 48 men is left to cover the retreat by holding a hill that overlooks the main road. Aware that they have been sacrificed to protect the division, the men of the rearguard dig in and fight hard. Instructed to make the Chinese believe that it is a regiment, the platoon succeeds in delaying the enemy for a period of time. However, each attack produces casualties, steadily depriving the platoon of its leaders. Although terrified by the responsibility of command, Corporal Denno (Richard Baseheart) finds himself the highest-ranking soldier in the platoon, and must lead the rearguard as it fights to survive. 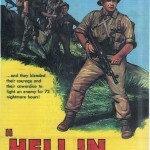 The Pentagon had expressed displeasure with director Sam Fuller’s earlier film, The Steel Helmet. Cooperation with the Pentagon was vital to make war movies, so the above paragraph appeared at the start of the film. A WWII veteran, Fuller had little interest in producing a glossy patriotic film that glorified the army, preferring to present the life of an average soldier instead. In fact, he believed that showing the truth was the only way to honor soldiers, regardless of criticism from the Pentagon. Tired and cold, the soldiers grumble about the weak coffee and unappetizing rations, but remain professional, motivated by a desire to survive, not patriotism. Drawing on his own experiences, Fuller focuses on the harsh reality of soldiers fighting in the winter. The soldiers are always cold, so they literally dream of dry socks. The platoon uses a cave for shelter, and at one point the experienced sergeant makes them take off their boots and socks and put their bare feet together to warm them while explaining the symptoms of frostbite. Soldiers in Korea always wanted to feel sore feet since no pain meant frostbite, which was as dangerous an enemy as the Chinese. MacArthur’s HQ in Japan had controlled the release of news to conceal the fact that MacArthur had forced the Eighth Army and Task Force X to advance recklessly towards the Chinese border, disregarding reports of large units of Chinese soldiers in North Korea, so the full scale of the crisis in leadership was unknown. Even if it had been, it is unlikely that Fuller would have been very critical of the American military during the middle of a war. Instead, the retreat is portrayed in a very favourable fashion. The major-general in charge of the division was wounded while inspecting the front lines, but he stays with the division despite his wound and his doctor’s recommendation that he be evacuated. There is no hint of the confusion of the collapse of the Eighth Army. The main command organizes an orderly retreat, and the divisional HQ has contact with all of its regiments. While the script is more generous to the American senior command than it deserved, the portrayal of the Chinese volunteers is quite accurate. Lacking radios, the Chinese commanders used bugles to give orders. The troops were armed with Russian sub-machine guns and they wore sneakers because there had not been enough time to equip all of the Chinese volunteers with winter gear, therefore the huge quantities of American supplies abandoned during the retreat were a blessing for the freezing Chinese soldiers. The movie’s sole mistake is the decision to film the fight scenes during the daytime. The Chinese usually attacked at night because they were defenceless against American bombers during the day. 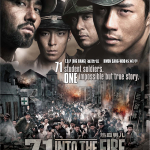 Furthermore, they generally employed mass attacks, but the film’s limited budget prevented the simulation of attacks by large formations of Chinese soldiers. Fuller was a novelist and screenwriter long before he became a director, so it should come as no surprise that he produced excellent dialogue. The internal monologue of Cpl. Denno’s character as he debates whether he is a coward while preparing to shoot an enemy soldier for the first time is fascinating. The script reveals what the men are thinking, instead of resorting to stilted, formal sounding conversations. Although it was only his fourth film, Fuller had become a skilled director. In particular, a tense scene in a minefield conveys the nerve-wracking experience of navigating a minefield in the dark. Fuller had just signed a seven-picture deal with Twentieth-Fox Studios, and Fixed Bayonets was his first film for the studio. 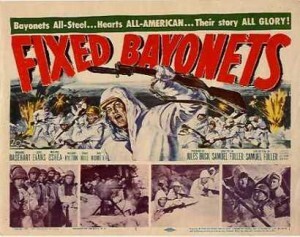 While the production values for Fixed Bayonets were low for Fox, the budget was still three times larger than any of Fuller’s previous films, which had all been independent features. The trade-off for access to greater resources was a surrender of control. However, Fuller had agreed to a contract with Fox because he genuinely respected studio head Darryl F. Zanuck and he was permitted to write his own scripts, instead of directing a script supplied by the studio. An extremely hands-on studio head, Zanuck was closely involved in both the writing stage and the post-production stage, but many of his suggestions strengthened the movie, including the decision to use a voice-over. When Zanuck expressed disbelief that a bullet could actually ricochet like it did in the movie, Fuller gave him a loaded Luger, which Zanuck fired in the screening room, and the bullet bounced off the cement walls repeatedly, proving Fuller right. It is worth mentioning that Fuller’s main concern was that the walls were thick enough to stop the bullet from exiting and harming innocent bystanders, not the likely chance that one or both of them would require urgent medical attention. 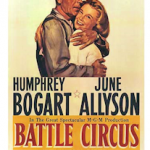 Fixed Bayonets was shot on two sets built on a single sound stage that was Fox’s largest but it was still a sound stage. In the days before CGI, movies with outdoors settings generally had a cramped atmosphere despite the use of painted landscapes as backgrounds, so cinematographer Lucien Ballard and Fuller deserve credit for creating a movie with snow-covered mountains that looks cold. Ballard had not reached the career peak that he would during his later collaborations with Sam Peckinpah, but he carefully positioned the actors and employed a crane camera to avoid the claustrophobic feeling of most movies filmed on a sound stage. Needing extras for an early scene of the division’s retreat, a production assistant found a number of dancers in a musical, and Fuller transformed them into tired soldiers by filling their packs and uniforms with weights. Richard Baseheart’s Cpl. Denno is the protagonist but Gene Evans’ Sgt. Rock is the star as a solid, gruff veteran. The decision to avoid the handsome leading men traditionally used in Hollywood war movies in favor of average-looking character actors makes the actors more believable as soldiers. While the story has few surprises, it is a tribute to Fuller and the actors that the movie is still entertaining and riveting. Fixed Bayonets was made by a professional who avoided patriotism, drama and heroics, just showing men struggling to survive.